You’re probably familiar with the mandarin orange, that small citrus fruit that makes such a great and colorful addition to salads and Asian dishes. 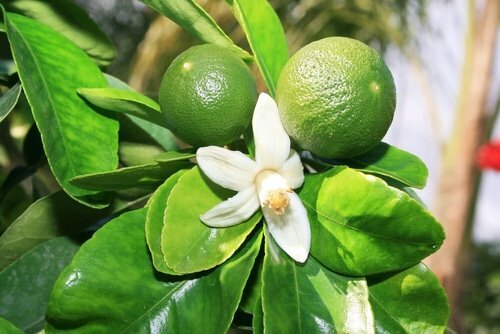 Though ripe mandarin oil is used in perfumes, incense, body oils, and cosmetic products, today we’re talking about “green manadarin oil,” which is simply oil produced from the unripened fruit. This oil has a tangy, citrus aroma that is considered gentle, uplifting, and cheering. In fact, it’s considered so gentle that it’s recommended for children and the elderly, and is called the “children’s remedy” in France. In skin care, it gives us that fresh, tangy scent that is perfect for waking you up in the morning, plus it also has toning properties that help revitalize and awaken your skin's appearance. Green mandarin oil provides a refreshing, toning effect on the skin perfect for first thing in the morning. The mandarin orange, which is scientifically called Citrus reticulata, is also known as the tangerine. The trees on which the mandarins grow are spiny varieties with slender branches and shiny, evergreen leaves. They can grow up to about 15 feet high, though the tree is natural small and considered ideal for back yards. White flowers that bloom in March and April. Like the fruits, the flowers smell great, and often attract hoards of honeybees. Citrus trees like the mandarin are native to southern China and Southeast Asia, and were brought to Europe and the Americas in the 1800s. This one likes full sun to partial shade, and once established, can usually tolerate drought conditions and is considered more “hardy” in cold temperatures than the sweet orange. Well-drained soils work best for growth. The tree starts bearing fruit after about 3-4 years, with harvesting potential throughout the year, depending on the variety. The fruits are ready to harvest when the skin turns a deep orange. All citrus fruits have natural antioxidants that are good for general health and for protecting the skin from environmental stressors. Tangy, refreshing scent: Because the fruit isn’t quite ripe, the aroma is tangier and sharp than it is once the fruit is completely developed. This tangy scent is perfect for cleansing formulas, as it helps to wake up both the skin and the person in it! Cleansing: Green mandarin oil is perfect for those with oily skin. Tighten and Firm: One of the most popular properties of green mandarin is its ability to tone and tighten skin. It can minimize the appearance of pores and help your skin to look more smooth and revitalized. Again, perfect for those with oily skin, who tend to have more visible pores. Antioxidant: Protection from environmental stressors. Balancing: Like many gentle, natural oils, this one helps balance oils—perfect for those with oily and combination skin. Gentle: Considered one of the “safest” essential oils, green mandarin is recommended for children, pregnant women, and the elderly. In other words, no matter how sensitive your skin is, you’ll probably be fine using this oil on it. As you can probably tell from the information above, green mandarin is ideal for cleansing formulas. Not only does it wake you up with its lively scent, it provides a balancing, toning, and stimulating action that helps your skin look awake and refreshed after you use it. Better than coffee, I say! Do you use green mandarin oil? Please share your tips. I used it in a diffuser in my massage office. 3 drops of Green Mandarin, 3 drops of Wild Orange, and 2 drops of Pink Pepper. It was invigorating with the hint of the spice. I plan to make some bath bombs with it!